Thanks to their excellent health benefits, grains have surged in popularity lately. There are infinite ways to prepare them, and in this episode Martha shows three of her favorites. 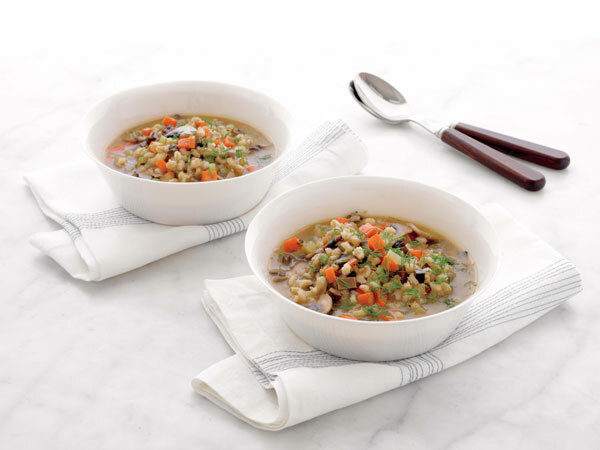 First she cooks up a Mushroom Barley Soup that’s based on her mother’s recipe. Next she makes Couscous Royale, a great way to showcase this versatile grain. She finishes up with Grits with Broiled Tomatoes, featuring bubbly cheddar cheese and crispy bacon. Martha Stewart soaks dried mushrooms in warm water to make them tender enough to cut. Try this grits with broiled tomatoes recipe from the "Grains" episode of Martha Stewart's Cooking School. Bring 4 cups of water and salt to a boil in a medium pot over high heat. Stirring constantly, add grits in a slow, steady stream. Lower heat to maintain a rapid simmer and cook, stirring, until water is absorbed and grits are smooth, about 5 minutes. Remove from heat and stir in butter and 1 ½ cups cheddar. Season to taste with salt and pepper. Preheat broiler. Divide grits among six small, shallow, ovenproof bowls. Sprinkle evenly with bacon and top with a tomato slice. Sprinkle with remaining ½ cup cheese. Transfer bowls to a rimmed baking sheet and broil until cheese melts and is bubbling, about 1 minute. Serve immediately. For the broiled tomatoes: Preheat broiler. Place sliced tomatoes on a baking sheet. Drizzle with olive oil and season with salt and pepper. Broil until softened, 2 to 3 minutes.